While researching everyday life during 1941 and 1942 for my current novel, I've been intrigued by the community involvement that supported the nation's war effort behind the scenes. Last month, I talked about rationing in World War II, and how civilian supplies were limited to aid the military. 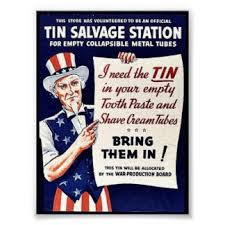 The other side of rationing was salvaging – giving the government personal goods to supply the troops. All over the country, there were public drives to salvage rubber, scrap metal, paper, silk and grease. Schools and civic organizations like Boy or Girl Scouts spearheaded these efforts to collect household goods and spur public involvement. Some towns held scrap metal parades with trucks and carts loaded with piles of metal. Women and children participated as cans were emptied and crushed, baking pans were donated, and garages cleaned out as they searched for any metal they could find, metal which would be used to make bombs and cartridge casings. Many towns had assigned areas where scrap metal was stacked as citizens proudly made sacrifices to support the war. Another recycled product was animal fat. These fats made glycerin, an essential ingredient in explosives. The government posted guidelines for housewives to collect their cooking oil or grease cooked off from meat so it could be reused. 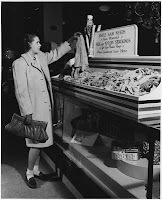 Signs were posted on meat markets or groceries designating them as “Official Fat Collection Stations.” Celebrities on the radio appealed to housewives to turn in their waste fat regularly. Often those who donated were compensated with a penny per pound or given points for rationing. The publicity campaigns that promoted salvaging appealed to the importance of those at home helping their soldiers on the field. As a result, there was a huge wave of patriotism that swept the country and encouraged civilians to proudly make sacrifices to aid the war effort and share the subsequent victory. I heard from several of you last month who remembered rationing or saw the coupon books. How many of you remember or heard of saving cans, grease or donating hosiery? 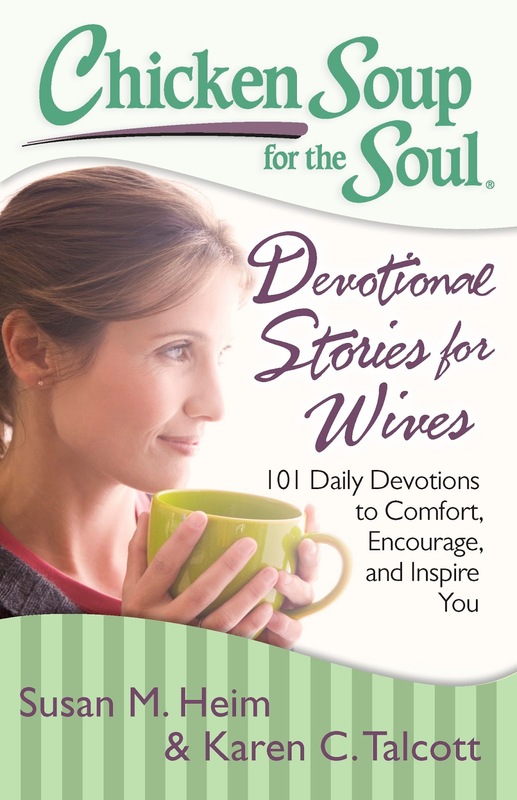 Now available: Chicken Soup for the Soul - Devotional Stories for Wives, available at - Amazon - Barnes & Noble- Goodreads. Sharon, we don't wear stockings much in Florida either! Has to be really cold (which is about twice a year), and then they're called "tights." I had never heard of leg makeup. Very interesting. I could not imagine drawing a line down my legs for seams. My mom saves grease. Wonder if that started then with her mother and was passed down? I'll have to ask. Thanks for sharing this interesting post! Sally, I actually talked to a lady who remembered using leg makeup. I think I'd have to get someone else to draw my seams though. She told me sometimes they just put a series of dots along the back of the leg which was easier than drawing a line! Yes, Sally, saving grease did come down from then, and I still save oil I've used to fry meat in a "grease can" and reuse it. I quit saving shortening grease when we learned the health hazards of the nitrites. Marilyn, I could not imagine having to use leg makeup. What was it made out of? Did they use a marker for the seams or dots? Martha, that is what mom does. She puts it in a can and reuses it. Thanks! I have to laugh, Marilyn. I'm one of those who drew lines down the back of my legs to look like I had on stockings. I remembered my mother doing this during the war, so when I was in high school, a bunch of us girls did it to get out of wearing hose to church in the hot Texas summer. We used an eye-brow pencil to draw the lines. I also vividly remember leg make-up. My mother and her friends did this all the time. My friends and I also collected tin foil and rubber bands and had contests to see who get the biggest ball of tin foil and rubber bands. I was nine when the war ended in August of 1945. Some of the things we did carried on for a few more years until the country got back on its feet. Martha, so glad you commented. It's great to hear straight from someone who lived it. My parents always saved foil and rubber bands and grease - guess they started that habit during the war. Thank you for sharing this interesting and informative post, Marilyn! I look forward to visiting with my grandparents and asking about what means of salvaging and rationing they recall. I do know my grandmother still saves her grease and reuses it. So glad to know how that began! Britney, I hope she refrigerates it now. Martha's right about the health hazards. But our ancestors would probably say the grease isn't what killed them! I grew up with my mother saving and reusing her grease in cooking. My parents also talk about being taught patriotic songs, having patriotic plays, saying the pledge and having prayer every day. My, how things have changed! Let us remember all of our freedoms and what a wonderful country we live in. Melanie, I truly believe schools were a safer place when we had daily prayers. Do they not say the pledge still? It's been a while since I had children in school, but I hope they still do. We're teaching our 4-year-old grandson to say the pledge. Had no idea about saving the grease, although it's something my mother, aunt, & grandmother do/did. I can remember wearing hose with seams (the seams were so hard to keep straight), & knew there was a shortage of hosiery during the war - but had never heard of drawing lines down the back of your legs. Yes, I vaguely remember wearing hose with seams and trying to keep them straight. Funny how women went from wanting people to know they had on stockings to not wanting people to know - to look natural. 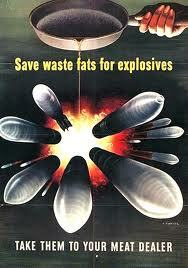 I don't remember ever hearing about saving meat grease for use in explosives. That was very interesting - never would have imagined! My parents always saved bacon grease in a little crock on the stove that then my dad would re-use when he made pancakes. My mom regularly cleaned it out though, and they don't do it anymore for health reasons. Both their parents lived through the Depression and both World Wars, so I imagine they learned many of the war-time habits from them. Bethany, my mother also saved bacon grease and used it for seasoning vegetables, but I never knew before I researched WWII that it was used for explosives either! I really enjoy these factoids...keep 'em coming! What an interesting post, Marilyn!